I have had some more fun with the “On the Town” set, this time with Memento inks and sponges instead of the watercolour approach I took in my last attempt. I did start with by flicking masking fluid onto my panel which is Neenah Solar White cardstock. I cut a hill mask and punched a small moon mask out of post-it notes and positioned them before sponging with two blue inks and a little yellow where the lamp would be. When the sponging was complete I stamped the trees along the hill then removed the mask. It is not very obvious but I sponged little bits of blue all over the snowy ground moving one wavy mask around to do so. I added the girls’ silhouettes next, then the seat, but before stamping the seat I positioned two small masks where the legs would be so they all appear to be in little snowdrifts. Next was the lamp and finally some shadows by turning the silhouette stamps upside down and stamping them in memento summer sky ink. When I rubbed the masking fluid off there were very few spots on the girls so I add a few here and there with white gesso and a toothpick. I still haven’t used every stamp in this set so there may well be another ‘walking home’. On the town is a transparent set which made it easy to lay the scene out first to work out where all the pieces would fit. Thanks for dropping by today. There will be more autumn tones later in the week. Wow! This is so gorgeous, Heather! 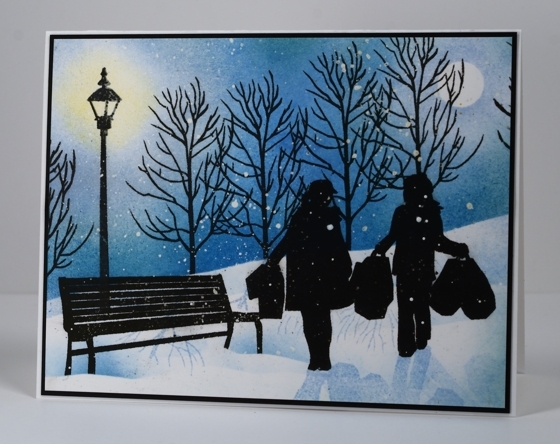 I love all the shading and the shadows and the “flicked” snowflakes! I am waiting for the stamps set from Penny Black… I am falling in love with this stamps after I saw what you do with… I love it! Simply Amazing! Your snowdrifts look real enough to give me a shiver. Heather you have wowed me again. You never cease to amaze me. Thanks for this beautiful piece of inspiration! I am wow’ed, too! Congrats on the Penny Black Facebook feature. This is so beautiful, Heather. I’m just awestruck by some of your creations. This is surely one of them. Just gorgeous. Are amazing! Super creative! You even add shadows!